Sweet, crispy, cheesy, there is nothing not to love about these Hasselback sweet potatoes. 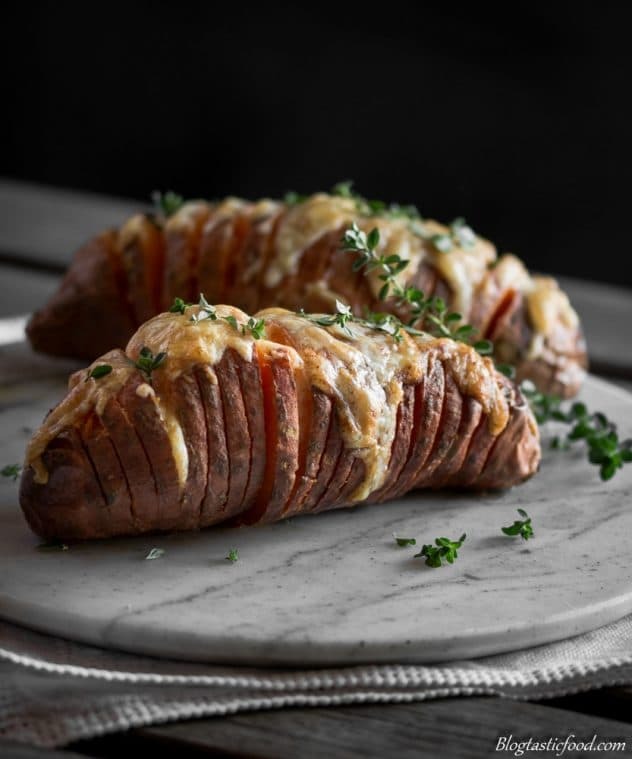 And they are much healthier than the original Hasselback potato recipe. 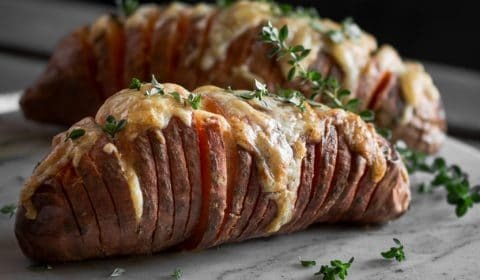 I know you may love the classic Hasselback potato with all the butter and carbs, just thinking about it right now is making my tummy go off. However, I really don’t think you’ll be disappointed if you give this recipe a go. 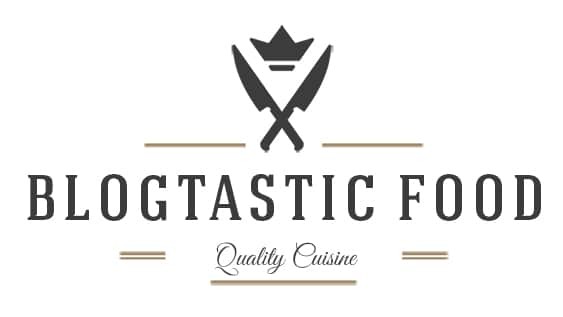 It has all those same elements that the classic recipe has, just in a cleaner way. I can honestly say that I could enjoy this as much as the original Hasselback potatoes. And yes, I really mean that. I am not a foodie that lies about these things. If I don’t like an ingredient, or if I don’t think the healthy alternative recipe is as good, I will let you know. What do the thin incisions do? 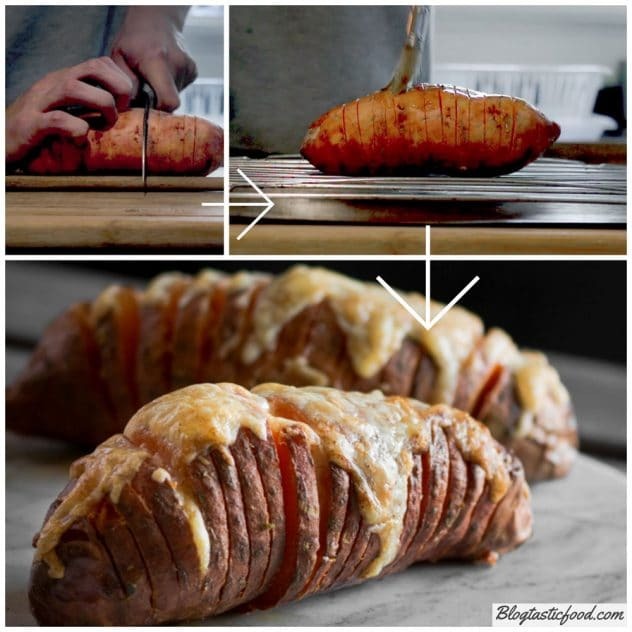 Now, this is what makes the regular baked potato, a Hasselback potato. It’s all about getting those slices nice and crispy. Now, the thinner you cut the incisions, the quicker it will dry out in the oven. So basically, what I mean by that is, the thinner, the crispier. So it’s important to know this because if you have super thick slices, you won’t get the best result. So keep those incisions thin and even. 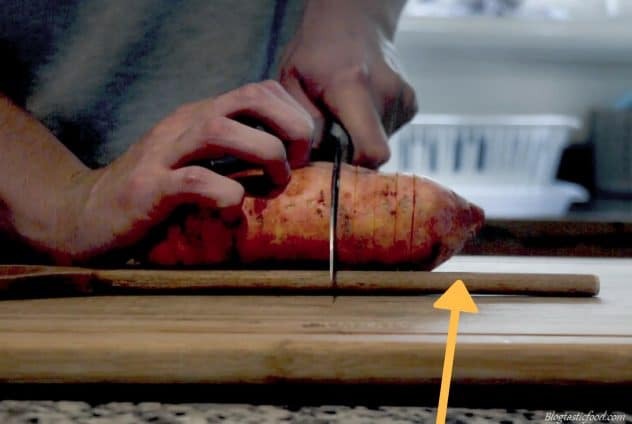 Now, it’s also important that you don’t cut all the way through the sweet potato, and you could just try to carefully cut it but since a raw sweet potato is quite tough, you have to push the knife down harder to cut it. This gives you very little control as to how far you want to cut down. And, you’re very likely to just cut all the way through that sucker. A much better and easier way to cut the sweet potato is to put the handle of a wooden spoon in front of the sweet potato. That wooden handle will stop that knife from cutting through the whole potato. The image below explains what I mean. How is this recipe healthier than the original recipe? Sweet potatoes are an overall healthier option than regular potatoes. According to Jamie Oliver (my absolute hero), sweet potato is high in fibre, and it contains 4 really important micronutrients. The first one is Vitamin C which is great for fighting disease, manganese which is great for your bones, potassium which is great for your blood pressure and thiamine which is good for your heart and nervous system. Now I am no nutritional expert, but I do think it’s common sense to realise that incorporating sweet potatoes into your diet can only be very beneficial. I also used olive oil as my fat source in the recipe. Which of course, is much healthier than adding a tone of butter. And to make things a little more interesting, I infused the oil with chilli and garlic, which worked like an absolute charm. That sweetness from the sweet potato just cuts through the chilli so nicely. If you think that a little sprinkling will leave you with a nice cheesy result, you’ll be disappointed. You’ll open that oven door, only to find out that the cheese mysteriously disappeared. And you won’t taste it much either. That being said, I am not saying to pile a cheese mountain on top of the potato either. I am just saying be generous. The photo below gives you a good idea of how much cheese to add. And as you can see by the end result, it almost looks as if I didn’t even add that much because it just sinks down as it melts. So that is why it’s important to be generous with the cheese. I just used regular cheddar cheese but if you want a sharper flavour, you can use a more matured cheddar cheese. Thank you so much for reading this post, feel free to subscribe if you haven’t already. And if you enjoy making veggies taste amazing, then you should also try these Baby Glazed Carrots. These Hasselback sweet potatoes are a great, healthy alternative to the original recipe. A great way to incorporate vegetables into your dinner. Pre-heat your oven to 190 degrees Celsius (375 degrees F). Get your sweet potatoes and slice about half a cm across, but 3 quarters of the way down, making sure you don't cut all the way through. Get your olive oil in a small pot or pan, then put on the stove on medium flame. Once the olive oil is nice and hot, add your garlic and chilli flakes. Fry for about 1 minute, then turn the heat off and let the garlic and chilli infuse in the oil. Meanwhile, get your rosemary leaves, thyme leaves and a good pinch of salt in a pestle mortar. Then bash until the herbs start to bruise and the oils start to extract. Add the herbs to the flavoured oil and stir through. Line a baking tray with baking paper or with an ovenproof wire rack and put your sweet potatoes on top. Brush your herby, garlic chilli oil all over the potatoes, then season well with salt and pepper. 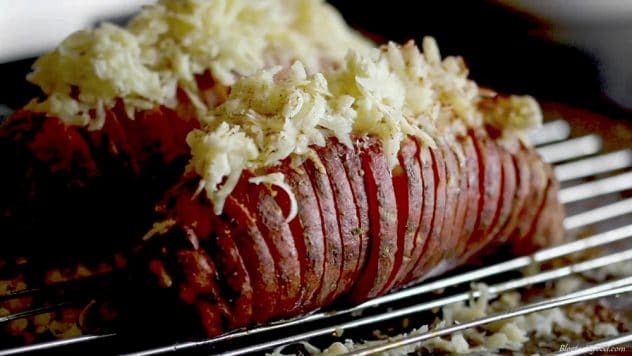 Take your sweet potatoes out of the oven and carefully put your grated cheese on top (try to put some of the cheese between a few of the slices but be careful not to break the sweet potato's structure). Finally, sprinkle a bit of paprika over the top, then put back in the oven and bake for another 15 minutes. 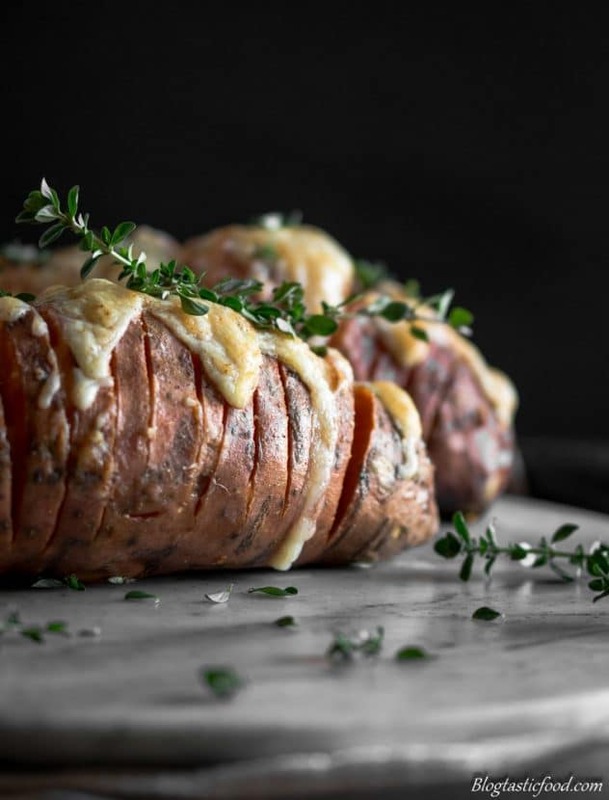 Once they are done, serve and enjoy ovenproof Hasselback sweet potatoes! The thinner you cut the incisions, the crispier your sweet potato will be. Put the handle of a wooden spoon in front of the sweet potato to make sure you don't cut all the way through the sweet potato. Be generous with the cheese. If you want a sharper flavour, you can use a more matured cheddar cheese. Really? they’re okay with the skins on? I always eat potato skin but sweet potatoes seem to have a thicker skin! Omg this looks sooo delicious!! I love sweet potatoes. Must try!! Why in the world have I never thought to try hasselback SWEET potatoes!? These look beyond amazing. Definitely need to try! Wow no worries my pleasure. So glad you liked them (: Thanks so much! A few simple cuts can really transform a potato into something special! The blend of herbs and spices you used here sound particularly winsome. Thanks, they make the potato go so nice and crispy after roasting. These look pretty irresistible Nick! I never thought of smoked paprika with sweet potatoes– but it sounds like a perfect match–sweet & savory. And, of course, as always, your photos are amazing! thanks thanks. Happy 2018!! that looks appetizing! Thanks for sharing. That looks beautiful Nicolas! I love roasted sweet potatoes, especially with the skin on. They are also great that way in a Buddha bowl with a drizzle of tahini and lime dressing. I’m going to try your recipe for sure!